Planet of the well-dressed apes. Commander in Chimp jokes aside, what the heck was Marilyn Davenport hoping to achieve by emailing this photo out with the accompanying text, “Now you know why no birth certificate.”? The gross display of racism – speciesism? Earsism? – whatever the heck this is, is in extremely poor taste. Then again, we did publish that photo of Michele Bachmann as a devilish succubus, so pot and kettle, man. The California N.A.A.C.P. is demanding an apology from an Orange County Republican official who sent out an e-mail picturing President Obama’s face on the body of a baby chimpanzee. In a statement Monday, the organization called on Marilyn Davenport to resign from the Orange County Republican Central Committee. 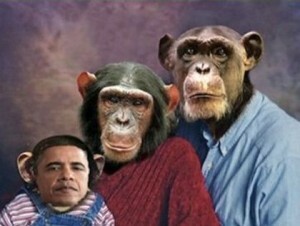 The message shows an image, posed like a family portrait, of chimpanzee parents and child, with Mr. Obama’s face superimposed on the young chimp. The text reads, “Now you know why no birth certificate.” Ms. Davenport could not be reached, but she has sent friends and supporters an e-mail saying she will not resign.